ASSEMBLE YOUR WAY TO SUSTAINABLE AND TIMELESS DESIGN. 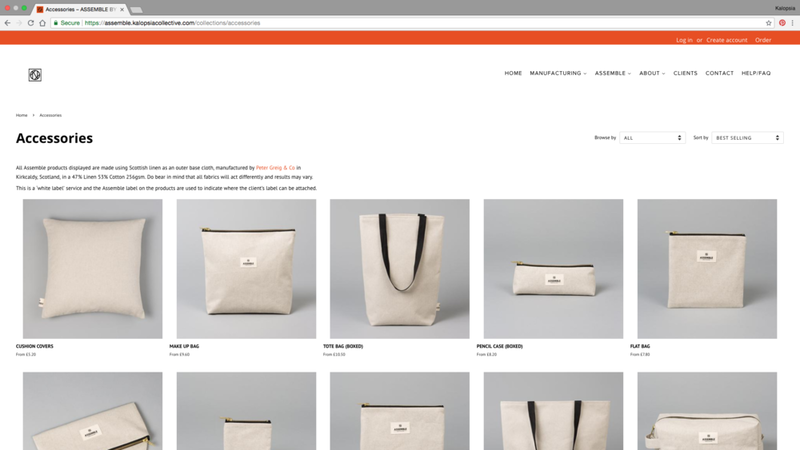 Assemble works as building blocks for mills, independent businesses and retailers . We have curated the collection to highlight craftsmanship and sustainability whilst considering functional, classic designs with contemporary, clean aesthetics. This allows each fabric to put its stamp on the product. There is no minimum order and we can manufacture up to 500 units per product. Check out our clients page to see examples of the range of materials we have worked with in the past. Assemble products are product templets that can be ordered in (almost) any fabric provided by you, the client. There are currently two catalogues to choose from - Accessories and Apparel. Both catalogues contain a range of classic product shapes. For each product You can pick the finishing, linings, zips, sizes etc, depending on your preferences. Fabric requirements can be found on the product pages and are also available to download as a PDF from the Fabric Requirements page. There are two ways to order Assemble products. The quickest and easiest way is through the Kalopsia website. Simply enter the options you would like for you products, along with the number of units you require. Then simply place the order just as you would with any other online store. Discounts and postage will be worked out for you automatically and will be displayed as totals once the order is filled out on the pages shown below. Alternatively, if you have a large or complex order you can request a line sheet from the Kalopsia team or download one from the Fabric requirement page. Line sheets should be filled out with the products details you require, using the same information requested on the online form. Additional information can be added about fabric variations and any other details. 4.What do I need to provideD? The key item you will need to provide us with is Your fabric. The fabric you provide should be suitable for the products you have requested and reflect the fabric details you have entered on the online order or line sheet. It is your responsibility to provide the correct amount of fabric for your order and to insure that the fabric is of a suitable quality. Fabric that is not provided correctly may be returned to you and your order may also be cancel. If you have chosen to provide you own zips and/or linings these need to be sent along with your fabric. We would suggest where possible, to use the zips provided by Kalopsia. Zip tape length may vary depending the the brand and teeth size and this can effect fabric allowances and over all finish of the products. Please ask a member of staff if you are unsure whether your zips are suitable. All Assemble pricing is quoted to include the stitching in of branding and care labels. If you would like these to be included in your products please send these with your fabric. Brand and care labels should be provided in a larger number than the amount of products ordered incase of damage or loss and all remaining labels will be sent back to you with your order. Kalopsia can not print or weave labels in-house and can not arrange for the labels to be manufactured on your behalf. If you are looking to have labels made we would suggest speaking to - GB LABELS who manufacture the labels in the UK also featured on the Assemble demo products. Please ensure that all parcels sent have the senders details included and a reference to the order they relate to. Our standard turn around time is four weeks from receiving Your fabric and payment. If you have a particular deadline you need your products by, please contact a member of the team to discuss options. Please beware that when working to a short turn around delays my occur. 6.What happens to my remaining fabric after the order has been completed? All usable fabric and labels will be returned to You along with Your completed order, unless otherwise agreed with the Kalopsia team as Assemble has been developed to be as environmentally friendly as possible.